Author’s Note: This is the first of the new weekly report format for the Prospero Legacy. I am still playing around with how to format these new reports so bare with me for the first couple ones. One thing that is very different is that I am no longer recording every single simoleon spent, this drastically speeds up my gameplay time and reduces the length of the posts. Week Eight in the Prospero Household is week full of accomplishments, breakage and lots of simoleons! The Prospero Family needs to make at least §300,000 simoleons in order to move to Windenburg since it is an affluent city. They are all very excited about the opportunity of moving to Windenburg and experiencing a larger and more vibrant city. Right after his birthday, the parents allow Forbes to remove all of Fortuna’s childhood drawings and splurge on a desk with a comfy chair and a nice computer for Forbes to practice his programming and video gaming in his room. Forbes really enjoys his new computer and loves playing video games in his room. Early in the week, Fortuna came down with an illness and decided since the next day was her birthday, she would take the day off from school and try to recover before her celebration. Fortuna was seeing stars while trying to complete her homework. Forbes looks quite proud of himself here for some reason. Author’s Note: Today will be the last Daily Report for the Prospero Family. I am running out of room on the blog and due to this I will be posting weekly reports instead. Each report will cover one week’s activities. This has been a big week for the Prospero Family, they have accomplished aspirations, written bestsellers and completed skills. There have also been several birthdays and today is another party for the Family! The kids are up first this Sunday morning. Forbes continues to practice chess, he is now learning the logic skill and Fortuna is heading downstairs to paint. Fortuna starts a large classic painting (§100), funds are now §150,680 simoleons. Week 7, Day 49 – The Announcement! Today is another special day for the Prospero Family. Pawel has a big announcement planned for tonight’s dinner that will chance the future of this family forever! The kids are up early this morning, even though it’s Saturday but they both need to use the bathroom. Forbes has to pee so bad that he is cross-eyed! Fortuna eats breakfast after getting ready in the bathroom. After eating Fortuna recycles her dish for §40, their funds are now §136,258 simoleons. Today is Rosabelle’s Adult birthday! Now that both Rosabelle and Pawel are adults with only a little more time for work, promotions and money making, they are looking toward their future and goal of 1 million simoleons! Rosabelle wakes up first, she is excited that it’s her birthday! Pawel is awake soon after. The parents tend the garden together. Belle is fertilizing and Pawel is spraying for bugs. The kids are up now and Forbes is creating an emotional potion for his aspiration, he needs to make three of them. The Prospero’s life is coming along nicely, Pawel is now an adult and Rosabelle will join him soon. The kids are progressing well in school, now it is time for some work promotions. Fortuna is also trying to find a boyfriend! Today Rosabelle, Pawel and Fortuna all receive the Marketable reward trait. This trait raises the value of all crafted items they sell in the future. This means that Rosabelle and Pawel’s books and Fortuna’s paintings will sell for more simoleons. Forbes grabs a yogurt because he is so hungry he can’t wait for Pawel to make scrambled eggs (§10) for breakfast. Their funds are now §95,986 simoleons. Have you ever wanted your Sims to live in the same houses as the Prospero Family? Now you can! Below you will find all the houses that the Family has resided in during this challenge. They are in order of most current to the original. This means most to least expensive. You can click on the house name or follow me on the Gallery under Love_Wasaabi. Today is a very important day, it is Pawel’s Adult birthday! The family is planing a quiet at home celebration and are excited for the big day! Rosabelle and Pawel wake up together this morning and tend to the garden together. After the parents finish gardening, Rosabelle joins the kids in the kitchen to make a birthday cake (§15) for Pawel. Fortuna and Forbes are finishing up breakfast before school. Funds are now §84,200 simoleons. 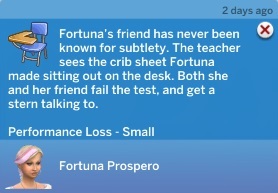 Fortuna is settling into the routine of High School, Forbes is almost an A student and today is the Parents day off again, so they are churning out books for simoleons to reach their goal of §1,000,000 simoleons! Fortuna is the first to wake up, she grabs some fruit and yogurt parfait for breakfast. Rosabelle is up next, she really has to use the bathroom! She is also quite stinky and needs a shower too. AUTHOR’S NOTE: AS I AM SURE YOU HAVE READ, I HAD A MAJOR ISSUE WITH MY GAME. MY SCREENSHOTs WERE NOT SAVING IN MY DOCUMENTS FOLDER, BECAUSE OF THIS I AM MISSING SCREENSHOTS FROM THIS MORNING. Today is the first day of High School for Fortuna and she is hoping to meet some new friends since she really hasn’t met anyone who she really likes. Forbes is working on being an A student and the Parents are working hard at their careers and writing. Pawel is the first person in the family to wake up, he really needs to pee! After using the bathroom, he goes to tend the garden. After while the kids wake up, Forbes grabs some breakfast and Fortuna, who isn’t hungry, tries to finish her extra credit work. Recycling §40, funds §68,740 simoleons. Rosabelle is the last one of the family to rise and she joins Pawel in tending their large garden. It is now time for the kids to go to school, they will both be trying to make new friends at school. Today is the Parent’s day off from work which is nice for them. The parents continue to tend the garden, some of the dragon fruits are ready to be evolved. Rosabelle evolves them to superb quality. Pawel takes a break from gardening to eat breakfast, afterwards he goes collecting around Skyward Palms. Rosabelle also eats after she finishes gardening. Today’s Royalty Report arrives, they earned §8301, their funds are now §77,041 simoleons. 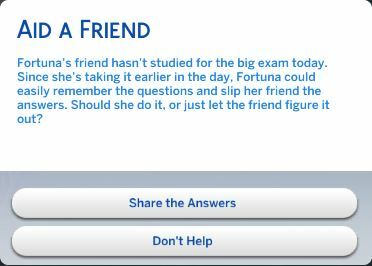 While Fortuna is at school she receives this opportunity and because she is such a nice person she tries to help out her friend.